Naxos Island is the largest island in Cyclades and it is one of the most beautiful among the Greek Islands. It combines superb fine sand beaches, with fertile valleys and mountainous beauty. It is one of the best holiday destinations among the Greek Islands, and its many attractions include the unique beauty, the variety of the landscape, the numerous historical places to visit, the beautiful walking wander routes, the tradition which has been preserved in many villages. Naxos is a popular destination for all kind of interests. It is a holiday resort for families, young and olds, people who really enjoy the sea and the sun and people with special interests such as civilization and history. Naxos has over 40 villages to visit and most of them have their own distinct character and style. Naxos Town (or Hora) is Naxos capital and port and it is a lively town with 8,000 inhabitants. Naxos Town combines beach (Saint George) and cosmopolitan town resort with a lot of interesting places to visit. Potamia is a group of three beautiful villages in a fertile valley. Melanes is close to Potamia and it is the place to see the huge statue of Kouros. Apeiranthos or T'Aperathou is a pretty village on the slops of Mount Zas at 650m altitude. Koronos, a stepped village is one of the most beautiful villages in Naxos Island. Keramoti is a very attractive village full of walnut trees and surrounded by mountains. Halki or Tragea once administrative centre, is a beautiful village with long history. Filoti is a nice village surrounded by olive groves and settled on the flank of Zas mountain. Sagri with its ancient monuments, Byzantine Churches, Venetian castles is one of the interesting places in Naxos. Galini and Eggares are traditional, quiet and peaceful villages, in the verdant Galini - Eggares Valley. The island of Naxos is an island steeped in history, and if you take time out to explore some of its most historical landmarks and monuments from the past, you will find your holiday experience enriched. The passing of the Venetians through Naxos left its mark on the cultural, religious and social life of the island. Part of the cultural heritage is revealed today through its fabulous architecture that the Venetians applied to castles and towers found scattered throughout the island. 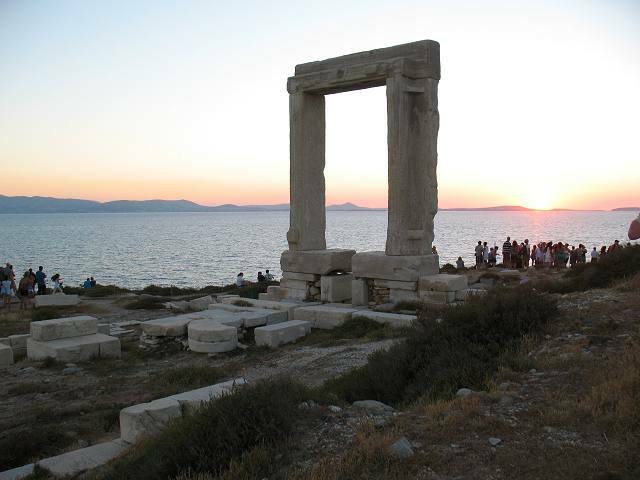 Portara is the entrance to an unfinished temple that faces directly toward Delos, Apollo's birthplace. The temple was begun about 530 BC by the tyrant Lygdamis, who said he would make Naxos's buildings the highest and most glorious in Greece. A medieval town in the heart of the Aegean still in its original form, inhabited continuously since 1207. The castle at the capital of Naxos, was constructed by Venetians in the early 13th century and was the center of their duchy in Aegean Sea. The towers and the mansions built in the castle provided a safe and comfortable settlement to the families of the Venetians officials for three and a half centuries. In the middle of the 16th century Turks conquered the island but they did not settle in for a long time and the Venetians continued living in the castle. It is one of the most important historical landmarks remaining in Naxos island and it is located 1.5 km to the south of Sangri Village. The Temple of Dimitra was built in the 6th century BC. One of the most important and oldest churches on Naxos Island. Some of the frescoes that have been saved date to the 6th century and are considered among the oldest in the Balkans. Agios Stephanos church (Tsikalario area of Halki), Panagia (Virgin) Protothronos church, Saint George Diassoritis Church, Panagia Rahidiotissa church, Agioi Apostoloi church at Metohi district of Halki, Agios Ioannis Theologos church at Kerami district of Halki. Saint George Beach, Naxos Town (Hora), Naxos Island, Cyclades, Greece.